To build on Assassin’s Creed Odyssey’s dense world Ubisoft has announced plans to add a New Game Plus option to the title. This should excite fans who have completed all there is to do in Odyssey, as it will likely open up a whole new experience for those who are hungry for more. Ubisoft took to the Assassin’s Creed official Twitter to make the vague announcement. With nothing more than a broad release window, fans have little to go on as far as what the new mode will include. Details are likely to emerge in the next week, so those eager for more information should have their ears to the ground. In an already massive in-game world with so much to do, New Game Plus may seem daunting for those who arduously completed all Odyssey has to offer. This intimidation is likely even more present for players who haven’t yet finished the game, especially when considering the amount of content Ubisoft has promised to regularly release for the title. Two new Lost Tales of Greece quests were just added to the game, as well as the latest bit of the Legacy of the First Blade DLC. With the final episode of the expansion is on its way fans will soon have a chance to keep their feet in the pool by slashing and looting their way across ancient Greece thanks to this upcoming mode. If Assassin’s Creed Origins is any indicator as to how New Game Plus will pan out, players will be able to carry over plenty of things from their previous playthrough. Character levels, skills and abilities, and that sweet loot were all available in a second trip through the title. 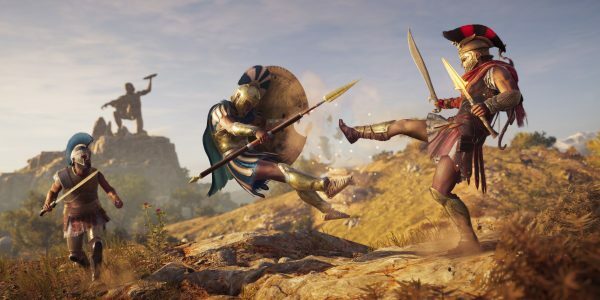 The formula works well, and unless Ubisoft intends to adjust it, this is likely what fans will get more of with Assassin’s Creed Odyssey’s impending mode.